As most parents will tell you, the arrival of children often mean that sacrifices have to be made. For some people this could mean giving up a hobby or having less time, money and energy to do the things they used to. And in the eyes of some children, this could mean that their parents just aren’t as cool as they used to be. This is the case for the boy in this story. The evidence of his dad’s former coolness is still there- he has a guitar and drum kit (stored away) and a motorbike (for sale) but now instead of rocking out, he does the laundry and vacuums the house. The boy wonders why it all changed- when did his dad decide to pack it all in and become a homebody? What made him give it all up? Many dads will be able to relate to this story (especially if they lived a wild life before the kids came along). The illustrations are simple yet striking, and it’s clever how one body positioning can take on different meanings with dad’s surrounds. For example, in one picture he is climbing the stairs with a laundry basket in his arms and on the following page, he has one foot up on an amp while he plays his guitar- same body position, different scenario. The juxtaposition continues throughout the book, as we see a tattooed younger man with a red mohawk acting out, in comparison to a slightly older tattooed man with a respectable haircut playing with and looking after his young son. 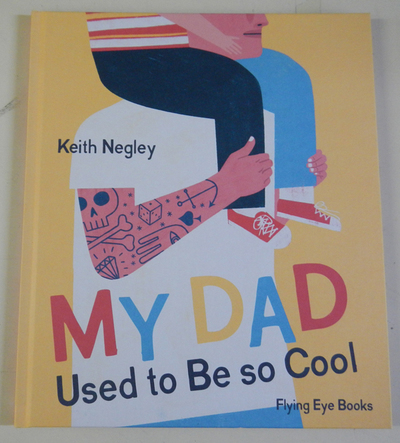 This is a great book for young dads who want to prove to their kids that they’re still cool, but now that circumstances have changed, they’re a different type of cool to what they used to be. 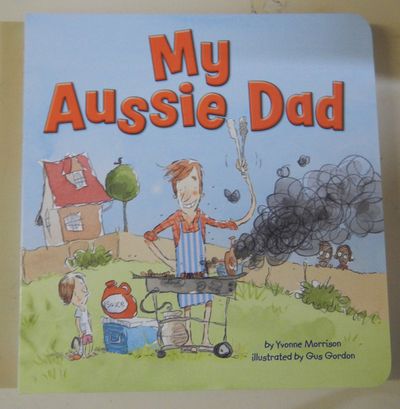 This board book is dedicated to all the fathers out there who meet the stereotypes of a truly typical Aussie dad. It’s for the dads who love to dress in singlets, stubby shorts and thongs. It’s for the dads who like to think they can cook on the barbecue but whose specialty is actually charcoal meat and burst sausages. It’s for the DIY, sports-mad, camping and fishing guru who thinks he’s at Bathurst when he’s at the traffic lights. It’s for the proclaimer who believes that feats he’s seen on television could be done just as easily by him. If your dad has any of the above traits and a good sense of humour, then this would make a perfect gag gift for him. With a playful and fun little story, this book celebrates the slightly embarrassing but wholly lovable Aussie bloke. 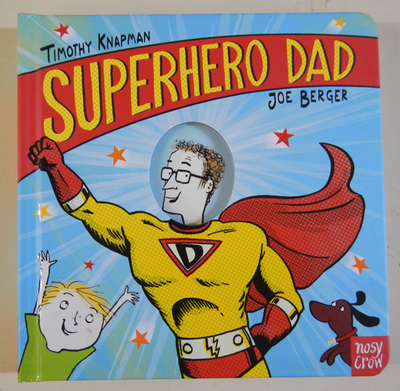 This is a sweet and humorous little board book that turns a seemingly ordinary man into a superhero in his child’s eyes. The illustrations are bright and drawn in a bold, cartoon-style (similar to those of superhero graphic novels) which only adds to the theme of the story. Although there’s no mention of it within the pages of the book, the ‘frame’ around the dad’s head on the cover could easily be adapted to fit a picture of your own dad’s face, creating an opportunity to personalise this book as part of dad’s Father’s Day present.